"All in all, it was going to be a hot summer." World War II has no shortage of tales about valor and combat, but those involving tanks are some of the more fascinating from a strategy perspective. The idea of both sides charging into battle with massive tanks rolling through is one that was really a modern (at the time) take on an older warfare strategy. 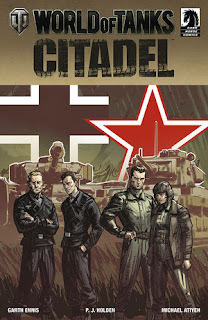 In World of Tanks: Citadel #1 from Dark Horse Comics, that strategy gets top-billing. The issue is written by Garth Ennis, illustrated by P.J. Holden, colored by Michael Atiyeh and lettered by Rob Steer. The Eastern Front, 1943: as the cataclysmic Battle of Kursk looms large, Captain Piotr Piotrowicz and his driver, Natalya ''Ginger'' Pulkhova, prepare their unit for action-- equipped with the worst tanks in the Russian inventory. On the opposite side, German tankers Karl Kraft and Freddie Stadler brace for the onslaught--well aware that failure here will put their Soviet enemy on the road to Berlin. Ennis' approach in World of Tanks: Citadel #1 is a lot of table setting that's done in a pretty engaging way. Each of the characters are given their own unique personalities that are somewhat military cliches, but still feel fun nonetheless. The stakes were extraordinarily high during World War II in 1943 considering how late in the way it actually way and Ennis uses that fact to ramp up the drama even more. Ennis also flexes a seemingly intimate knowledge of the machinery at the center of the book which lends credibility to the central plot of the issue (and subsequent series). Ennis throws a lot at the reader despite the seemingly simple concept of tanks charging one another in combat, but that depth is exactly what makes his work here so profound. Holden's approach on the artwork is nothing short of phenomenal. The scale of the tanks relative to the soldiers is a great reference point for the reader and Holden has no trouble ensuring the reader knows that the war was rife with the massive machines. The soldiers also boast great facial expressions that underscore the fear and grit required to be a soldier in World War II. There are a couple of action sequences where Holden gets to showcase air combat and the way he mixes the air and ground portions of the strafing runs is near perfect. Atiyeh does excellent color work as well, covering the pages in browns and greens that fit the typical colors of combat and soldiers. World of Tanks: Citadel #1 is a solid first issue that really sets the stage for a great new series. The Battle of Kursk was a massive battle and the characters headed towards it in the series seem to know the stakes as well. Ennis' script is rock-solid and evenly paced, showing the reader the heroes and villains set to square off against one another. Holden's artwork is a great match to the script and does a great job of showing off the technologically-focused combat aspects of the war. World of Tanks: Citadel #1 will appeal to fans of the property as a whole or readers just looking for a good war book that focuses on lots and lots of tanks. 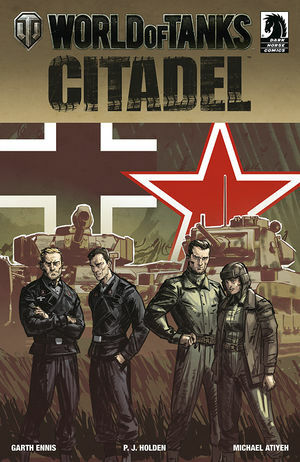 World of Tanks: Citadel #1 is available May 9.